Caroline moved to San Francisco in the '90's from New Jersey. She began money management and bookkeeping in a variety of professions; retail, service, and corporate, by temp-ing and taking different jobs. She mostly found a home as Office Manager and bookkeeper at DNA Lounge, for over a decade. Taking the next step, she finally went back to school and completed her accounting degree at Golden Gate University. 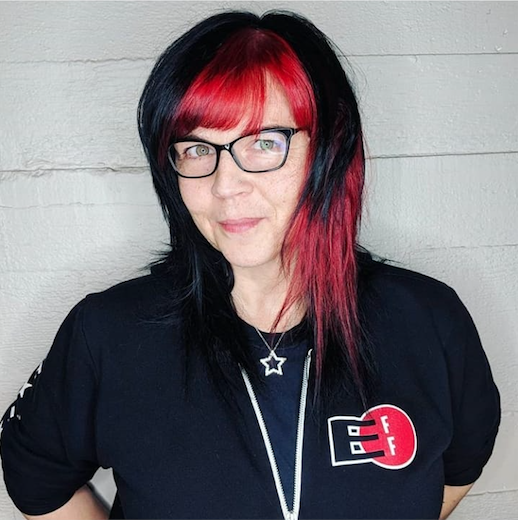 After getting her accounting degree, she worked for a publicly traded software company in San Mateo for a few years, but was glad to make the move to working in the non-profit sector, especially here at EFF. Caroline moved to San Francisco from New Jersey...Navigating the nightlife and tech booms since the nineties, she has always worked between the two worlds, from QA contracts at Macromedia and PeoplePC to bookkeeping for entrepreneurs, nightclubs and entertainment companies. Most recently, she was the Office Manager and Bookkeeper at DNA Lounge for 11 years. Since then she went back to school to complete her accounting degree (Golden Gate University) and went to work for a publicly-traded software company in San Mateo, dealing with all their SEC required work and audits as a GL Accountant. She didn’t mind the 20 mile commute each way, but she did miss the city, and decided to come back and work in SF again, supporting more meaningful work!